Great ideas can’t exist in a vacuum. Successful innovations grow from the rich ecosystem of innovative culture. The path from brainstorming to project execution must be standardized so your leadership team can improve it with every iteration. Every organization must design and implement its own unique Innovation Management System based on its horizon strategy, industry and market, current level of innovation ambition, and other specific internal and external factors. Easiest and fastest way of doing so is to start from a general framework and configure it to match your own specific needs. 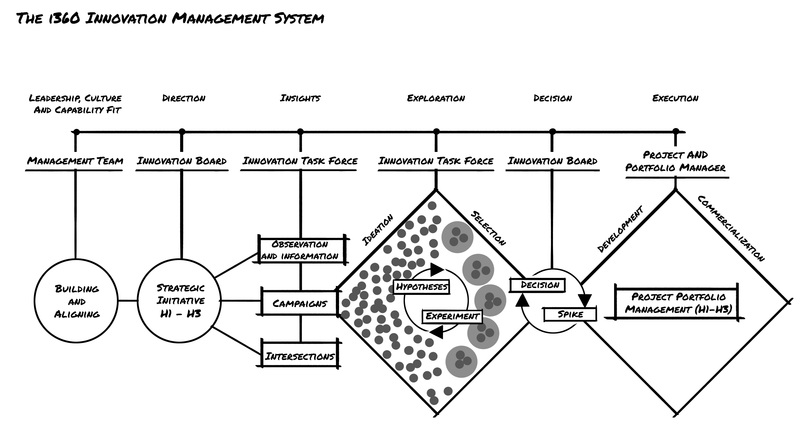 The generic Innovation360 Innovation Management System, as depicted in the illustration below, is our general framework for best practice. The Innovation Process: This process is divided into the exploration (ideation and project selection) and execution (development and commercialization) phases. The exploration phase is normally handled by a specified innovation team while execution takes the form of projects, startups, or the merger/acquisition of other organizations. Innovation Governance: The Governance model describes how the innovation work is managed, including direction, during the exploration phase and how it is optimized during the execution phase with portfolio management of innovation projects. Innovation Organization: The position of the innovation organization is actually a design choice, and may take the form of a central department, several collaborating satellites groups or a cross-functional team integrated within the existing organizational chart. After many years working with companies of all sizes in many different markets, we have learned that best practice for implementing an Innovation Management System is to implement it in several smaller steps, as opposed to a big-bang fully formed project. The smaller steps are also often better received and more carefully and successfully implemented. Contact the experts at Innovation360 to help you design the right Innovation Management System for your growth strategy as well as possible steps for its successful implementation. 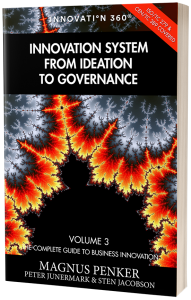 A functional innovation system consists of three major parts, as detailed in our own Innovation System: From Ideation to Governance, Volume 3 of the Complete Guide to Business Innovation. The most important ongoing standardization work on Innovation Management System is the ISO/TC 279 technical committee’s work on the development of the new ISO 50500 series of standards due for publication in Q4-2018. The new ISO-standard will be a guidance standard (as opposed to a certification standard) and have a lot in common with e.g. the already published European standard for Innovation Management Systems called the CEN/TS 16555 Part 1-7, but as the upcoming ISO 50500 standard is both a truly global standard and a more recent development that the CEN/TS 16555 it will most likely set the global stage for Innovation Management Systems after its release! Innovation360 group is participating actively in the ongoing work of ISO/TC 279, in general, but also more specifically as a member of its Working Group 4 (WG4) on Innovation Management Assessment where we are contributing to the development of the standard as it evolves toward finalization. Our main reason for this participation, is to assure that both our work with Innovation Management Systems and InnoSurvey®, our solution for Innovation Management Assessment, will be fully compliant with the upcoming ISO-standard as we strongly believe this will be a very important requirement from the global innovation community after its release!